Most blown dunks? Worst defender? The 2016-17 NBA season’s most dubious achievements. Andrew Wiggins’s defense was bad last season. Real bad. Tonight at New York’s Pier 36, the NBA will host its first annual awards show, heaping praise on the best and most outstanding players of the season. We are here today to do the opposite. Thanks to a draft-day trade, Tom Thibodeau is reunited with defensive stopper Jimmy Butler, and not a moment too soon. Butler will be joining forces with the single most catastrophic defender in the league: Andrew Wiggins. 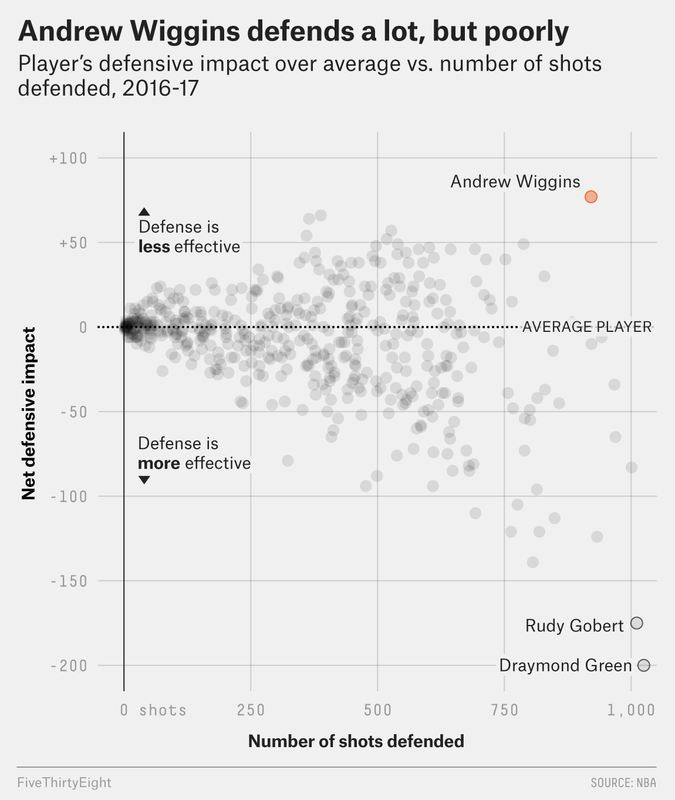 Using the NBA’s player-tracking data to look at shots defended and how those shots turned out,1 we can see who’s making a positive impact, who’s making a negative impact, and who’s making the most impact. Possession by possession, there are a few defenders who are as bad as Wiggins. When Wiggins contests a shot, opponents have a 56.1 effective field goal percentage; when they are unguarded, they have a 56.4 eFG percentage. Fundamentally, getting a shot up against Andrew Wiggins is the same as getting an open shot. Wiggins’s deficiencies are too many to list quickly, but at root the issue seems to be basic effort. He barely jumps to contest shots, doesn’t run hard to close out, and gets lost watching the ball. But the truly destructive part of Wiggins’s defense is how much of it there was. In the way that defenders like Draymond Green or an in-his-prime Tony Allen seem to be in all places at all times, challenging seemingly every shot on the floor, Wiggins is omnipresent in his awfulness. He defended the 10th most shots in the league, by far the most by a below-average defender. Most teams do their best to hide their weak defenders, but opponents seek Wiggins out like no other defender in the league. The missed dunk is one of the more universal plays in basketball. In a split-second, it has a neat little narrative arc: the audacity to leap in defiance of gravity and the instant comeuppance. Some players experience this more than others. Marquese Chriss experiences it more than anyone. Chriss missed 26 dunks this season, four more than second-place DeAndre Jordan … on 146 fewer attempts. Chriss’s 79.8 shooting percentage on dunks is the worst mark Basketball Reference has on record for any player who tried at least 100 dunks in a season. Not all missed dunks are of equal difficulty, of course. Dwyane Wade getting stuffed by the bottom of the rim in a playoff game is not the same as Chriss blowing in-traffic NBA Jam dunks. But there’s a certain charm to Chriss’s misses, like he knows they aren’t “all worth two points” and he’s determined to collect the difference, even at the cost of the two points. At a certain point, you just have to admire the confidence. Marcus Smart was not the worst 3-point shooter in the league this season. But he was the worst 3-point shooter who routinely took a lot of threes. Smart took 4.2 3-pointers per game in 2016-17 and made 28.3 percent of them. Only two players in the 3-point era have taken four or more 3-pointers per game and shot a worse percentage than Smart did this season: Mookie Blaylock in 1997-98 and Latrell Sprewell in 1994-95. And it’s not like Smart was launching nothing but bad shots, either — 3.1 of his 3s per game came on spot-ups, which are usually high-quality looks. But Smart shot 31.2 percent on those. Smart contributes in other ways — mainly through being Point Guard Ben Wallace — and his shooting percentage did, briefly, see an uptick in the playoffs. That’s enough to make him useful, at least on a team that gets stomped by the Cavs. In a lot of ways, 36-year-old Jamal Crawford is miraculous. In his 17th season, Crawford played 26.3 minutes per game and averaged 12.3 points on 52.6 percent true shooting, just a hair under his career mark. But on the nights he doesn’t have it, he really doesn’t have it. On January 8, Crawford played the single worst game of the season by any NBA player. In a home win against the Miami Heat, Crawford put in 31 minutes and went 1-for-12 on 2-point shots (0-for-4 from three) while collecting one rebound, one assist and two turnovers. He came out of the game with a break-even plus-minus, though any success the Clippers had was mainly due to a great game from Chris Paul (19 points, 18 assists, 1 turnover) and Heat players Dion Waiters, Rodney McGruder, Wayne Ellington and Willie Reed going a combined 7-for-32. On the one hand, it’s frustrating that the Lakers have to sell off their best young players in order to get out from under contracts that were bad news from the moment they were signed. On the other hand, hoo boy, those young players really, really didn’t play well when they were all on the court together. D’Angelo Russell, Jordan Clarkson, Julius Randle, Brandon Ingram and Larry Nance, Jr. played 108 minutes across 20 games this season — not a huge sample, but not quite nothing, either. By pure net rating, they were the second worst lineup in the league (-28.3 points per 100 possessions), trailing an especially grim configuration of Sacramento Kings. But it’s not so much the margin that was demoralizing about the group as it was the humiliating way in which it was run up. Out of 103 non-free-throw scoring plays against this Lakers’ lineup, 24 were dunks. (For comparison’s sake, the league-average team would figure to allow 10.3 dunks for every 103 buckets.) Not mere layups, not simple wide-open shots — dunks! A quarter of all points from the floor scored on the Lakers’ Team Of The Future were on dunks, as though the goal of the defense was to corral the opposing team into the most efficient route possible on the way to the rim. For the most part, teams know that defenses play better coming out of timeouts than offenses. There’s no cross-matching to worry about, and no early-shot-clock semi-transition rush job to stamp out. Every time an offense called a timeout in 2016-17, the ensuing play was worth about 3.5 points per 100 plays for the defense compared to typical halfcourt offense. So the offense generally needs to cram enough value into that time to make it an even proposition — advancing the ball late in the game, or subbing in shooters, or trying to take the air out of a run. For some teams that’s possible. For a team that digs as deep a hole as the Clippers, good luck. The Clippers got 10 points worse per 100 plays every time they called a timeout. This is confusing, because the Clippers had one of the best halfcourt offenses in the league, ranking fourth at 98.6 points per 100 plays. But after timeouts, that rate shrunk to 88.7. It’s not just a matter of inferior bench players coming in after the timeout, either: Chris Paul and Blake Griffin, both excellent halfcourt players, fall off significantly after timeouts. Paul’s typical halfcourt offense is good for 101.2 points per 100 plays; he falls to 87.7 after timeouts. Griffin’s falls from 96.6 to 84.7. After timeout stats tend to be noisy, and in 2015-16 the Clippers were one of the better teams in the league in those scenarios. But in 2016-17, no team lost more steam during breaks than the Clips. The player to whom no one passes the basketball is a typically a well-earned title, and one held by the inimitable Bismack Biyombo for the last few years. This season, however, Biyombo’s offensive role has, erm, flourished. He averaged a robust six points per game for the Orlando Magic after posting the highest usage rate of his career, at 13.2. But with Bismack abdicating the throne, who is the least passed-to man in the league? Finding players to whom no one passes is easy thanks to the NBA’s player tracking data. Take the number of “front court touches” (that is, the number of times a player touches the ball on the offensive end of the floor) and subtract the number of offensive rebounds he collected, and you’ve got something close to the number of times he was passed the ball. Unsurprisingly, the list of players who don’t see much of the ball fit a profile: big men who are on the floor for defense and rebounding, not scoring. Strictly speaking, Jakob Poeltl and Lucas Nogueira see the least of the ball on a per possession basis, which is probably to be expected on a team with DeMar DeRozan and Kyle Lowry. But a little ways down the list is another name, and a bigger number: Tristan Thompson played 30 minutes per game for the Cleveland Cavaliers, but was passed the ball just 14.6 times per game and 17.5 times per 36 minutes. Thompson isn’t as offensively bereft as many of the other players on the list this season or in seasons past. He has good instincts in pick-and-roll and finds space off the ball (or at least, puts himself in positions where LeBron James can find him). But he also has by far the smallest offensive role on the team. Kevin Love, who has seen his role reduced drastically from his superstar days in Minnesota, got 37.8 touches per 36 minutes. James got 66.8; Irving got 67.2; even Iman Shumpert, who cannot dribble, pass or shoot, got 30.1. Richard Jefferson, who was drafted when Thompson was 10 years old, got 26.8. Like Marcus Smart, Thompson has other skills that are important to the Cavaliers. They trust him with important responsibilities. Just not with the basketball. These values are based on shot location, defender location and other variables. The “expected” value is based on what a shooter would make against an average defender given shot distance and the time on the shot clock, and the net value displayed is the difference between that expectation and the result that the defender allowed.